In prior visits I’d been relegated to the Business Class section, which represents the vast majority of the space in the lounge. But today, given that I was traveling in First Class, the lounge attendant escorted us through the magical double doors leading to the dedicated First Class section of the lounge. To call this a true “First Class” lounge would be a bit of a stretch. Instead, it’s more of lounge-within-a-lounge, with more privacy than is typically provided in those instances. The lounge seats well over 20 people, but we were literally the only passengers in there, and remained the only ones throughout our visit. So naturally, we threw our things around and truly made ourselves at home. The food selections were limited to finger foods, which was fine since I wanted to save my appetite for the flight. I grabbed a bag of chips (ok, a couple) to snack on. Later, I made my way over to the buffet to check out the sandwiches. And somehow pulled myself away from this mountain of instant noodles that was calling my name. Instead I limited myself to the healthier options, like this veggie platter. There was also a cream of chicken soup that was delicious. 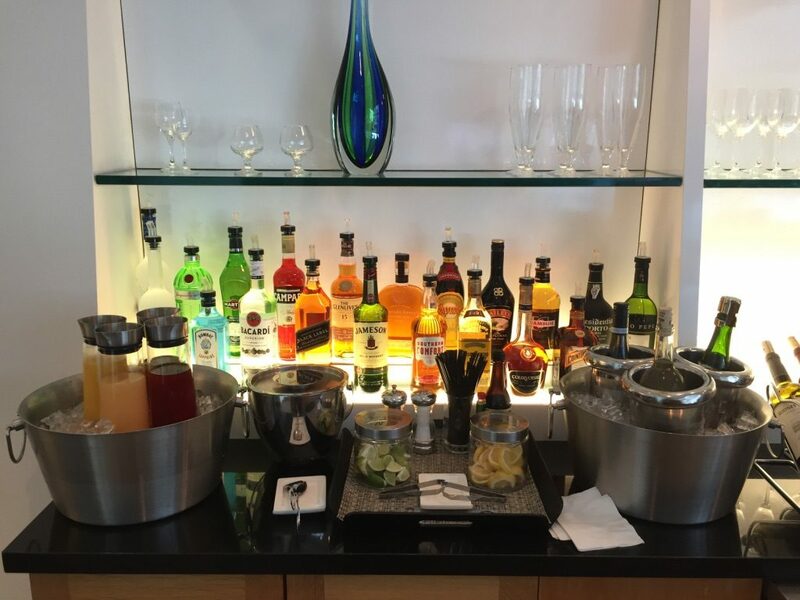 The bar was well-stocked, and included a full liquor cabinet with mixers, along with beer and wine. We spent the next hour lounging around, while face-to-face with this beauty. The British Airways lounge is roughly on par with its peers at SFO, including the Singapore Krisflyer and Cathay Pacific lounges. In some ways, it may even be superior than those options, given the private section for First Class passengers. However, I’d rank it a clear cut below the United Global First Class lounge and Emirates lounge which remain my two favorites at SFO airport. On last picture, that’s a China Southern 787 that fly CAN-WUH-SFO and you can redeem SkyMiles for their F/J.